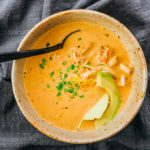 A comforting and creamy Instant Pot soup with shredded chicken, salsa, and Mexican flavors. Low carb, keto, and gluten free. Cut the cream cheese into 8 cubes. Set aside to soften while you work on the rest of the recipe. Add chicken broth, salsa, and taco seasoning mix to the pressure cooker pot. Stir together until well-mixed. Add chicken breasts to the pot, submerging them in the liquid. Secure and seal the lid. Cook for 25 minutes at high pressure, followed by a manual pressure release. Uncover and transfer only the chicken breasts to a plate. In a heatproof bowl or measuring glass, add softened cream cheese and 1 cup of hot liquid from the pressure cooker pot. Whisk for a few minutes until smooth. Pour the cream cheese mixture into the pot and stir it in. Turn on the saute mode for medium heat. While waiting for the liquid to come to a boil, use 2 forks to finely shred the chicken and return them to the pot. Let the soup boil for a few minutes, stirring frequently. Turn off the saute mode. Serve in bowls and top with avocado, cheddar cheese, and cilantro. This recipe yields 5.5 g net carbs per serving (1 cup of soup).